The Nigerian Army yesterday said troops of Operation Lafiya Dole in the Northeast killed 21 Boko Haram fighters in Jarawa area of Borno State. 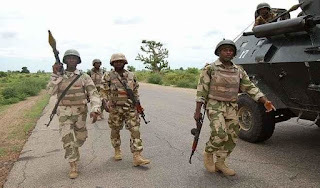 A statement by Army Spokesman, Brigadier General Sani Usman said during the operation 1, 623 residents of Jarawa were rescued. He said, “While advancing, the troops came under heavy fire at Jarawa village. The troops responded decisively and went further to clear Deima, Artano, Saduguma, Duve, Bardo, Kala, Bok, Msherde and Ahirde settlements. He said the rescued persons have been escorted to Rann Internally Displaced Persons (IDP) Camp, while all the children were vaccinated.